You know that quote that’s floating around? Well, today’s post is brought to you by the awesome Kozy Shack who is all about wholesome ingredients. Long live real food! And a special thanks to Kozy Shack for sponsoring today’s giveaway and my stroll down memory lane! It’s been 15 years since my grandma passed away. It feels like yesterday and even typing those words brings tears to my eyes. I still remember so much about her. I was only 12 when she went to heaven and I so wish I could have lived much more of life with her by my side. 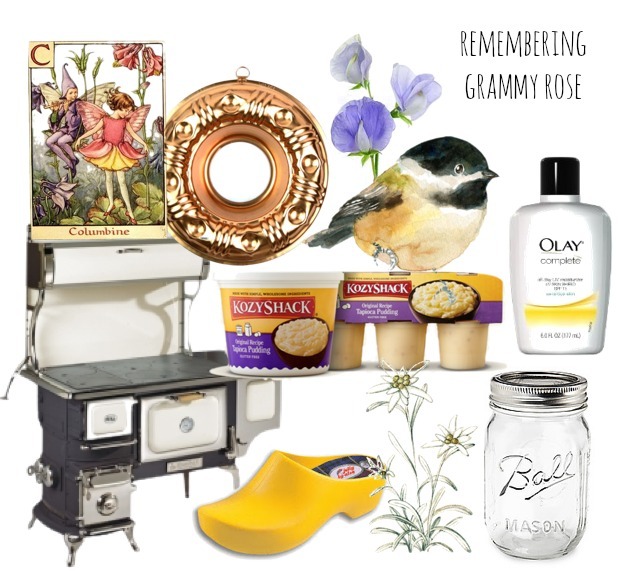 A peek at some of the little things that remind me of my Grammy! She loved all these things before they were popular! Food is one of those wonderful things that lock in distinct connections and memories. It’s definitely the case with my Grammy. We often made cookies, as all good grandmothers do, and had staple favorites we liked to enjoy together like peanut butter and banana sandwiches and graham crackers dipped in milk. They were her favorites that she shard with me. Her fridge was always stocked with half and half, Smuckers jam and tapioca pudding. I loved these things, because she loved them. To this day, I still love all these foods, as odd as some of them are. They’re what I grew up on and when I take a bite, especially tapioca, a flood of wonderful memories come rolling in. Food is such a sweet gateway to making memories. In honor of my Grammy, I’ve been so excited to introduce Jemma and Max to many of the the favorite snacks Grammy and I used to share. First up, tapioca! Jemma even started a new tradition of adding a dollop of tapioca to the top of her peanut butter and honey sandwich. I preferred mixing mine with chocolate covered almonds and peanut butter granola. To each her own! Favorite Kozy Shack flavor ~ Original Rice Pudding! I have only ever tried their original rice pudding… but I'd like to try all of them! My favorite Kozi Shack pudding flavor is Rice Pudding.